Please contact us if you wish to return an item for whatever reason within 48 hours of receipt. Items must be returned within 14 days. Faulty or incorrect items will receive a full refund or replacement..
Gorgeous Cruella De Ville shawl bag and choker set. Velbour dalmatian fabric with a red shimmer satin lining Adult size 10/14 Choker...ties at the back with a red ribbon Small handbag....with a red.. If unsatisfied with the item then a full refund will be given once the item is returned. 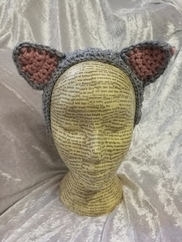 Crochet cat headband ear warmer. Great for cosplay, Halloween or even just cold days out. The headband measures 18 inches long (with some stretch) and 2.5 wide with 6.5 inch long braided tails on each..
Gorgeous fur fabric cruella dalmation shawl set. Finished with a red shimmer satin lining. Adult size 10/14 Set includes..... Small hand bag with a red ribbon handle,large enough for all your night..